Home / GST-Tally / Create a Advance payment to Supplier under GST? Create a Advance payment to Supplier under GST? In this post, we know about advance payment made to Supplier (Registered or unregistered) under GST with Tax Effect. Press Alt + V for record Advance payment under Reverse Charge. This voucher is not contain any tax liability and will part of the excluded vouchers. Select Account Cash or Bank, from which payment will be made. Select party ledger and enter details of advance payment. Enter amount and GST implications will show on this stage. This is ledger level payment item, if the stock item attracts reverse charge then select stock item instead of Ledger Name to configure for reverse charge. If the stock item being purchased from unregistered dealer does not attract reverse charge, do not configure the stock item for reverse Charge. 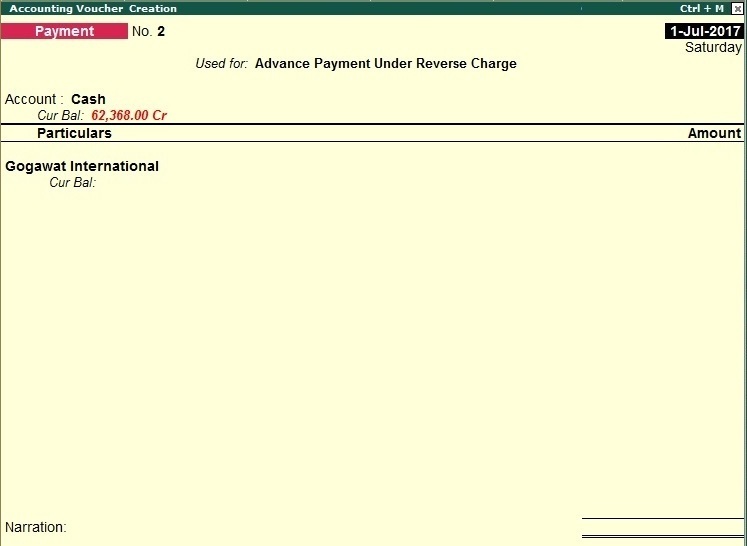 Select the ledger contained for reverse charge in the Advance payment details screen. You can also modify the tax rate and tax amount on advance payment details to press F12. Select modification of tax details to yes (for change the tax rate and amount manually). Select amount inclusive of tax to yes for showing amount inclusive of tax.